Elon Musk has, as I imagine he often does during meetings or long car rides, come up with an idea for a new thing. Unlike the Hyperloop, which was cool, and various space-related ideas, which we know he’s at least partly expert about, this one is just plain bad. It’s basically Yelp But For Journalism. He may as well have said, I found this great can marked “worms” and I’m going to open it, or, I’ve determined a new method for herding cats. 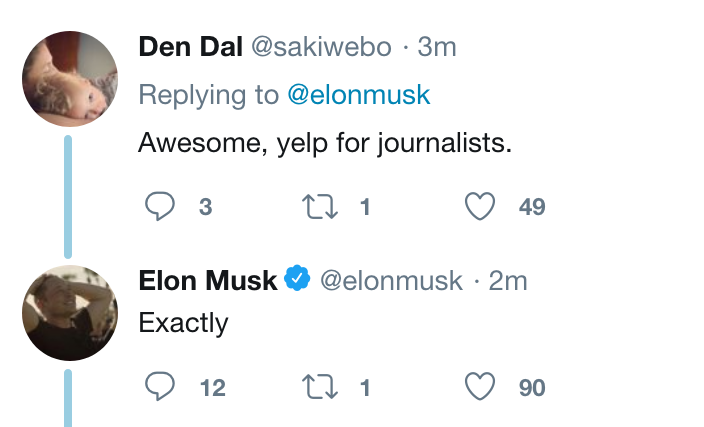 My guess is Musk does not often use Yelp, and has never operated a small business like a restaurant or salon. Especially in today’s fiercely divided internet landscape, there is no reliable metric for truth or accountability. Some will say The New York Times is the most trusted newspaper in America — others will call it a debased rag with a liberal agenda. Individual stories will receive the same treatment, with some disputing what they believe are biases and others asserting those same things as totally factual. And while the truth lies somewhere in between these extremes, it is unlikely to be the mathematical mean of them. The “wisdom of the crowd,” so often evoked but so seldom demonstrated, cannot depend on an equal number of people being totally wrong in opposite ways, producing a sort of stable system of bias. The forces at work here — psychological, political, sociological, institutional — are subtle and incalculable. Enough of the public does care about the truth. I have faith in the people. The origins of this faith, and of the notion that there is somehow a quorum of truth-seekers in this age of deception, are unclear. Facebook’s attempts to crowdsource the legitimacy of news stories has had mixed results, and the predictable outcome is, of course, that people simply report as false news with which they disagree. Independent adjudicators are needed, and Facebook has fired and hired them by the hundreds, but is yet to arrive at some system that produces results worth talking about. Fact-checking sites perform an invaluable service, but they are labor-intensive, not a self-regulating system like what Musk proposes. Such systems are inevitably and notoriously ruled by chaos, vote brigades, bots, infiltrators, agents provocateur and so on. Likely as a demonstration of his “faith in the people,” if there are any on bot-ridden Twitter, he has put the idea up for public evaluation. Currently the vote is about 90 percent yes. It’s hard to explain how dumb this is. Yet like most efforts it will be instructive, both to others attempting to tame the zeitgeist, and hopefully to Musk.